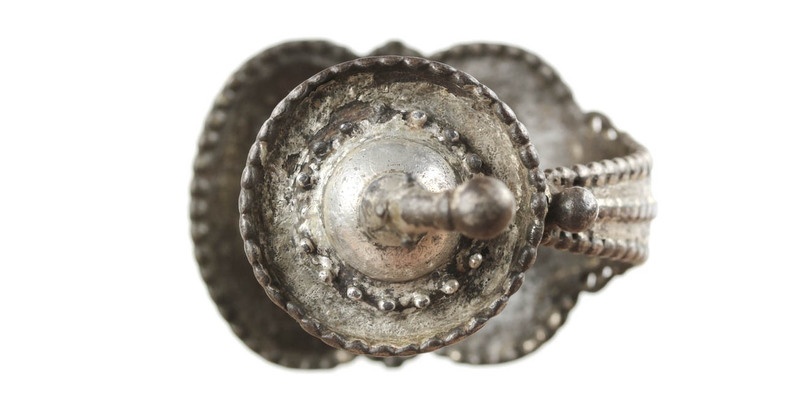 Origin: India, probably Mahratta culture. 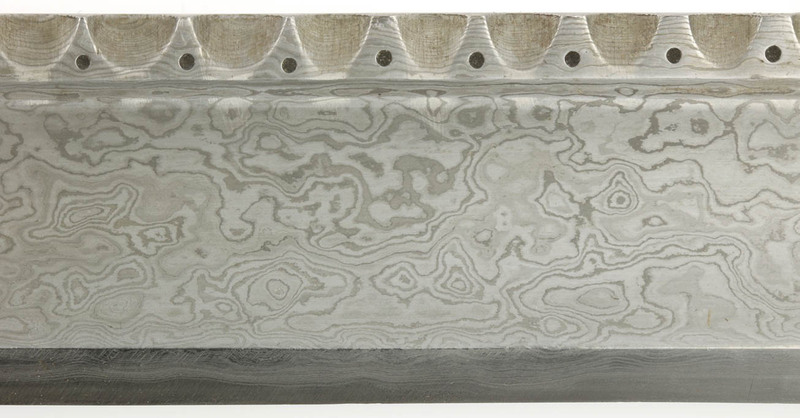 Materials: Pattern-welded mechanical "damascus" steel, iron, silver. 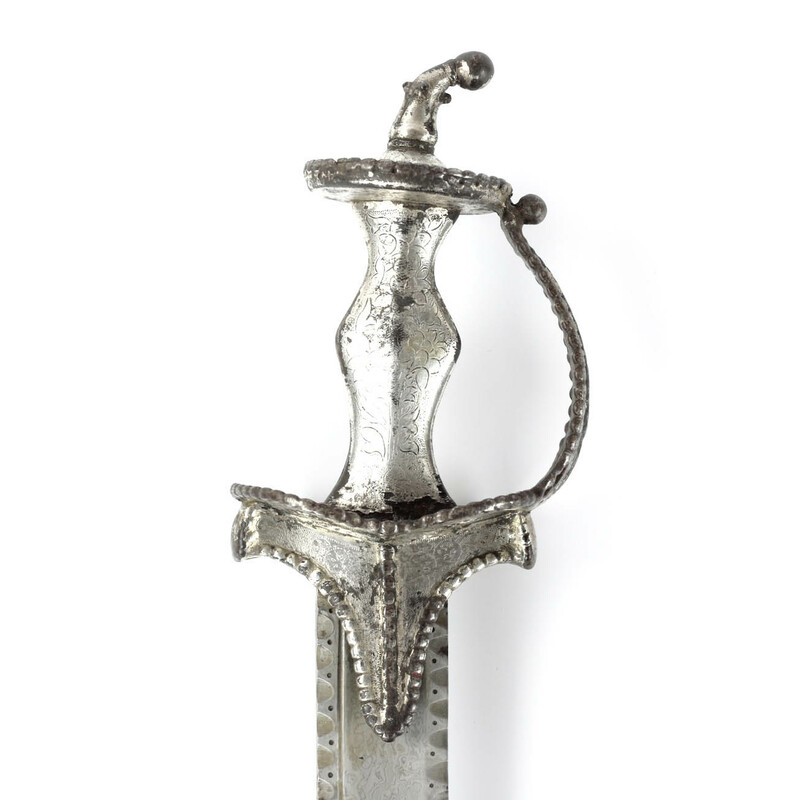 Scabbard: wood, velvet, iron, silver. This one is for the connoisseur of blades. 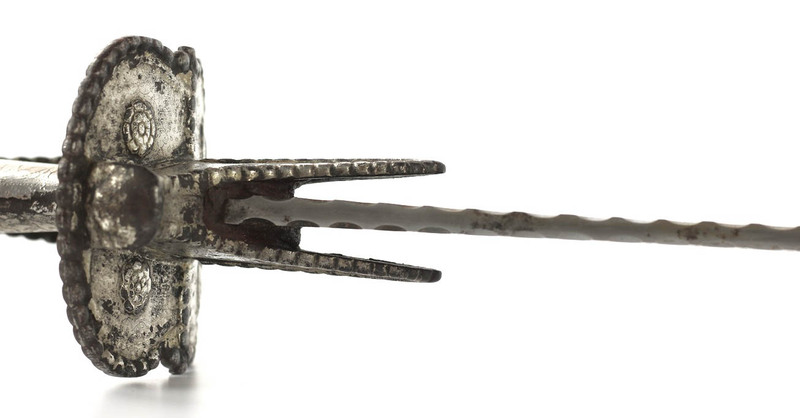 It has an impressive straight single edged blade with an acute, double edged tip. 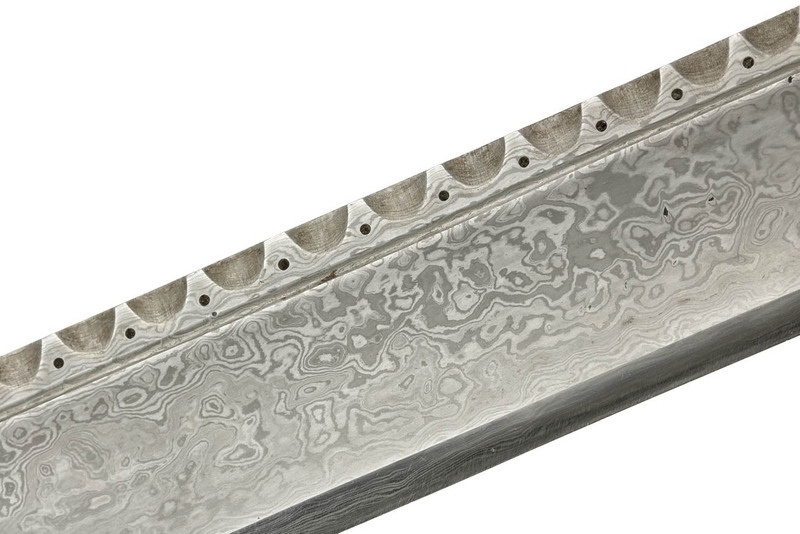 It's forged out of fine mechanical damascus with an exceptionally bold and lively pattern brought out with a light clean and etch. 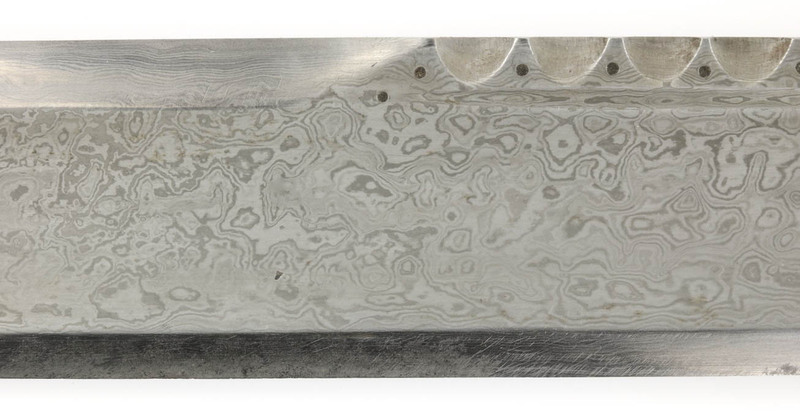 The pattern is very even, almost flawlessly forged, showing the smith's considerable skill. 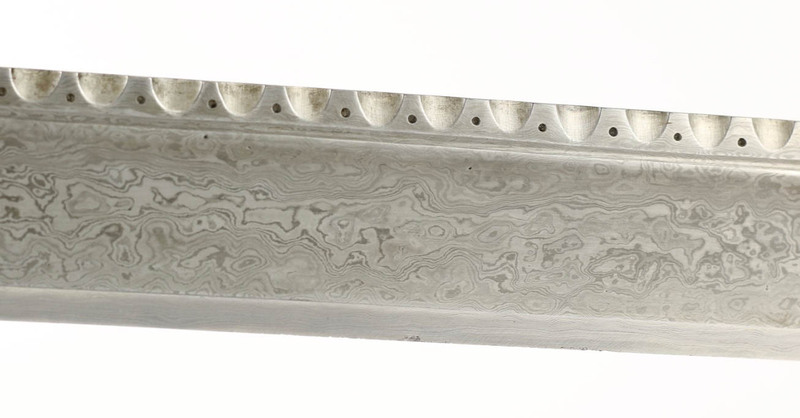 At the back one can see the blade is of a three plate construction, with a high-carbon edge plate -tempered to a high degree of hardness- laminated between layers of milder steel for strength. 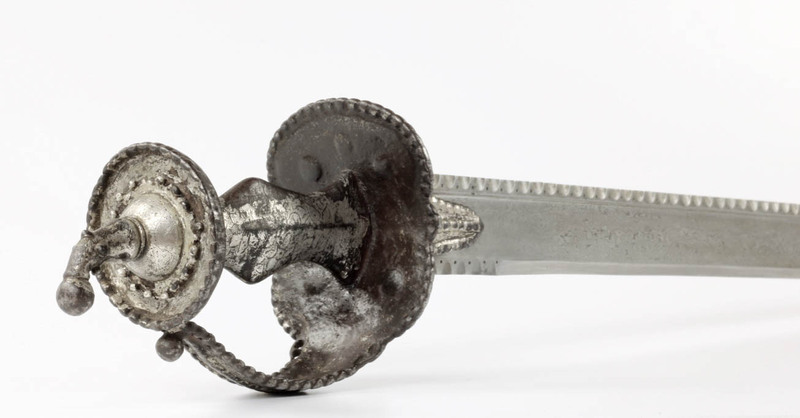 The blade is hollow ground with a narrow groove running just under the spine. It's most striking feature, apart from the bold pattern, are series of notches filed along most of the spine and a short area of the forte. In-between each notch is a small dimple, and both narrow grooves also terminate in a small dimple. The whole is of excellent geometry and finish. With original wooden scabbard covered with deep purple velvet, now largely faded. 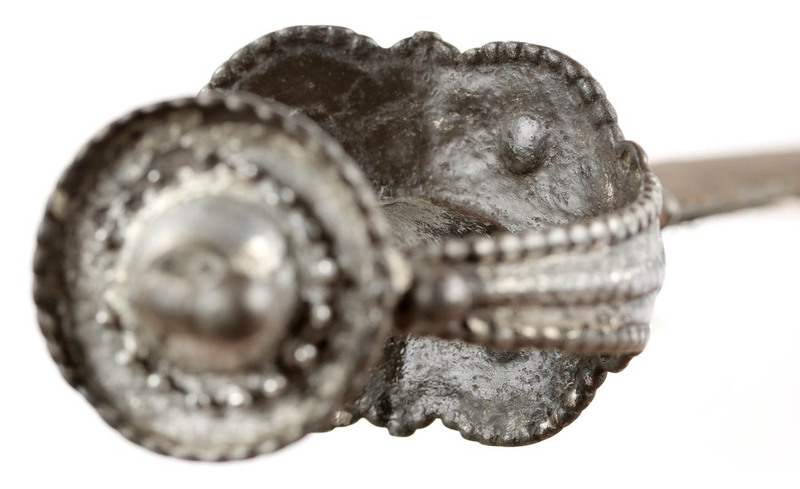 The original color can be seen where it is covered by the handle when sheathed. Over the middle is a line of red and white braided cord. 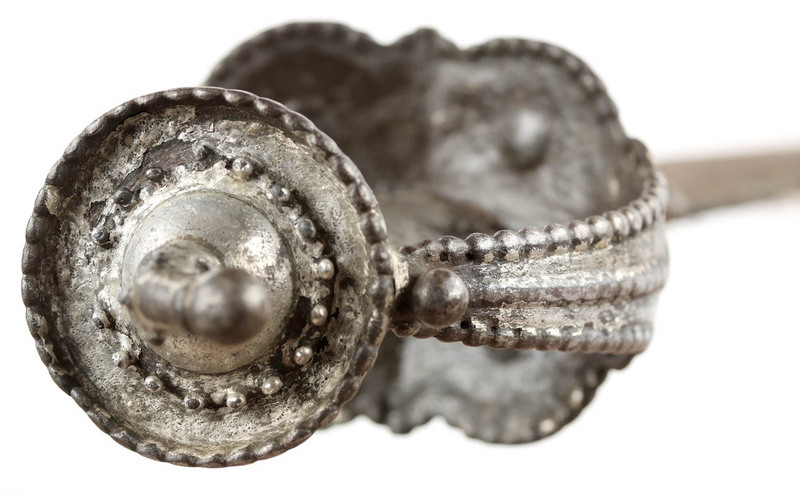 It has two iron fittings, both once covered in silver, now mostly gone. 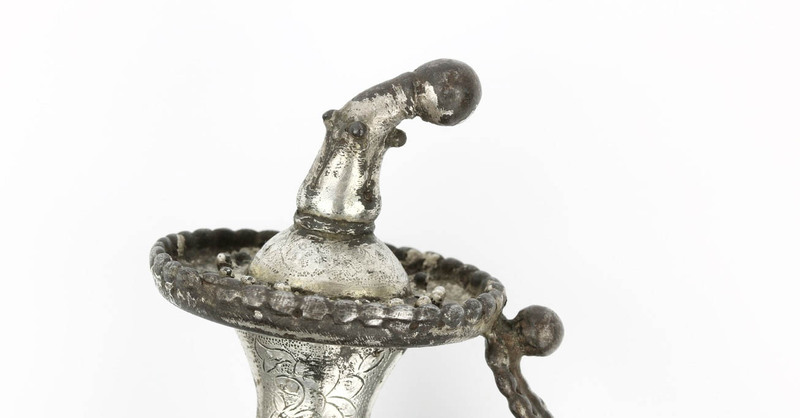 Silver damascened iron has the tendency to start to shed its silver after a century or so, which can also be observed on this hilt. What is still there is in good condition with no loose parts or flaking. 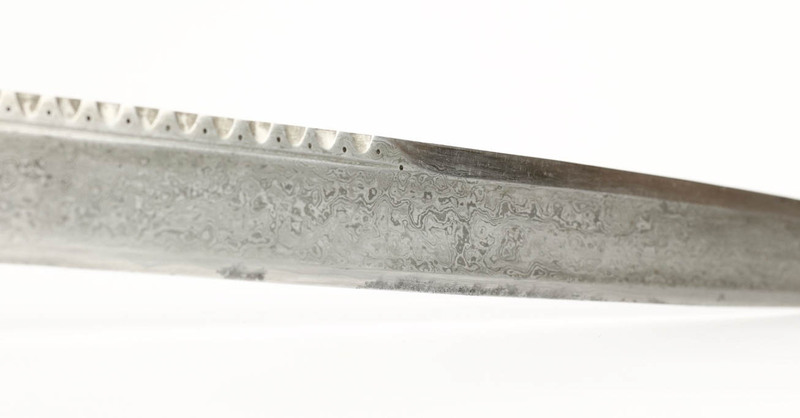 The blade is in remarkable state of preservation, with no nicks, cracks, and only very light corrosion here and there. 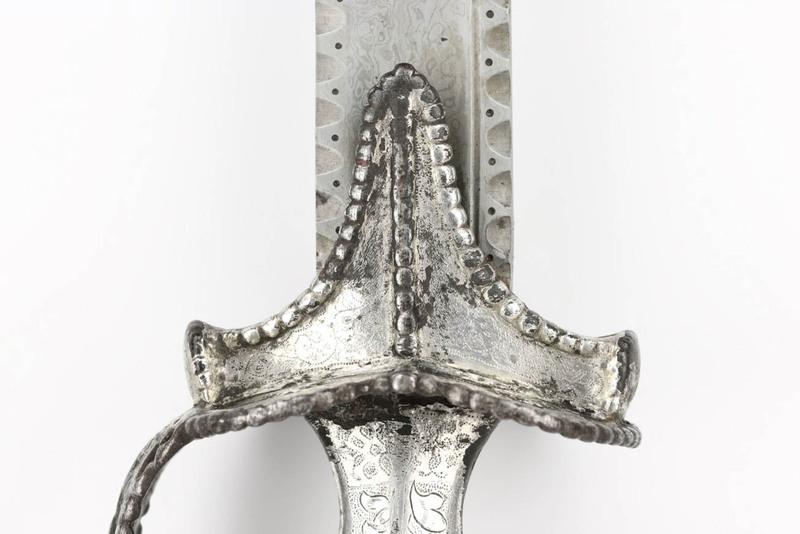 It is an excellent fit to the thoroughly aged scabbard which indicates it's probably either original to the piece or at least as old as the scabbard. 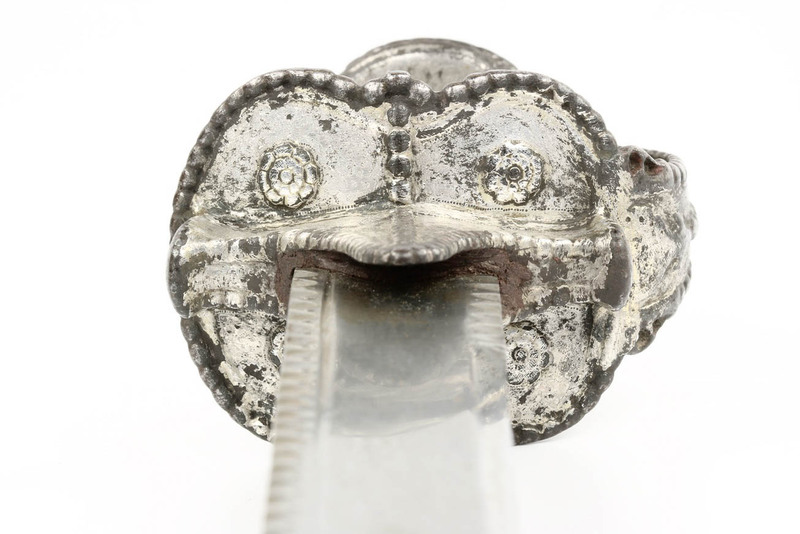 Such "freak conservation" of part of an antique can happen when the blade was kept stored, well oiled and protected in its scabbard while the hilt remained exposed to the elements. The scabbard wood is mostly intact but dried and fragile, and there are some minor losses to the velvet covering. There is a skilful, almost invisible repair to the wood and velvet near the tip. 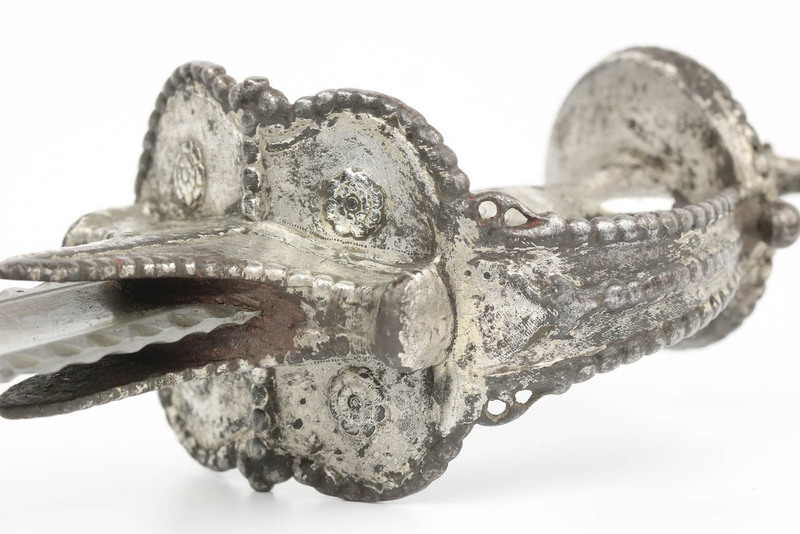 Its form is very close to what collectors would call a kirach , a weapon associated with the Mahrattas. 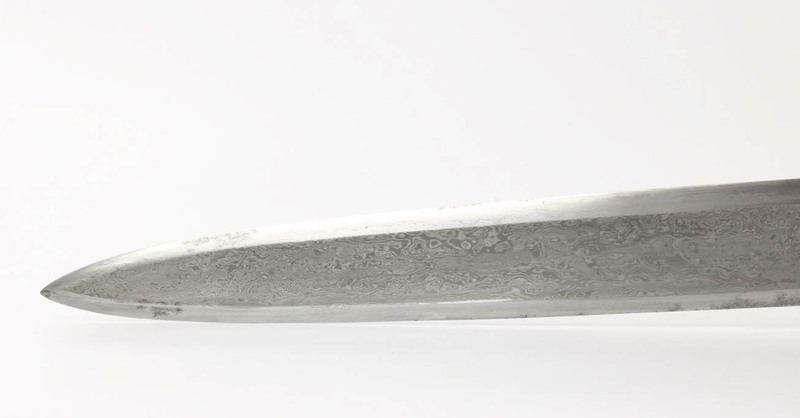 These tend to have a slightly more forward curving blade while this example is perhaps just a millimeter from being completely straight. 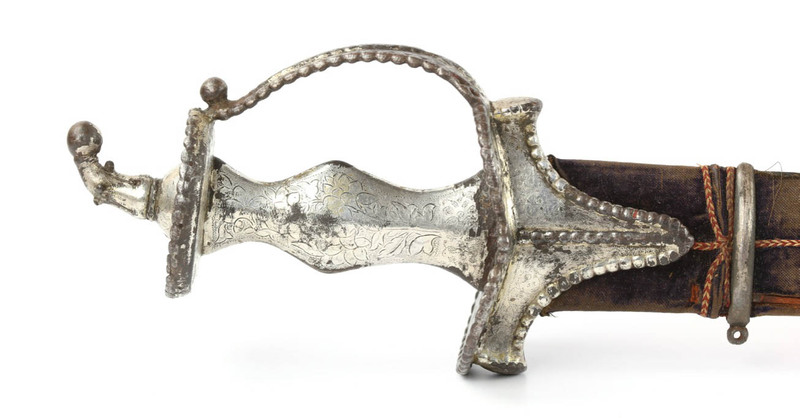 Rawson classifies similar Indian swords as sukhela but this may rests on a misunderstanding because sukhela is the name of a type of Rajasthani mechanical damascus steel.2 Sikh martial artists refer to this type of sword as katti , which is also a general term for sword in south India.3 At this point, my best bet is that it falls under the kirach classification. 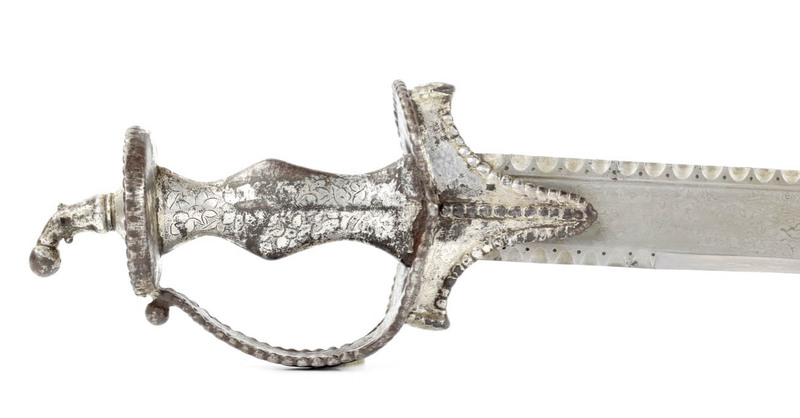 A large and impressive Indian straightsword that doesn't rely on wootz and gold to be attractive. 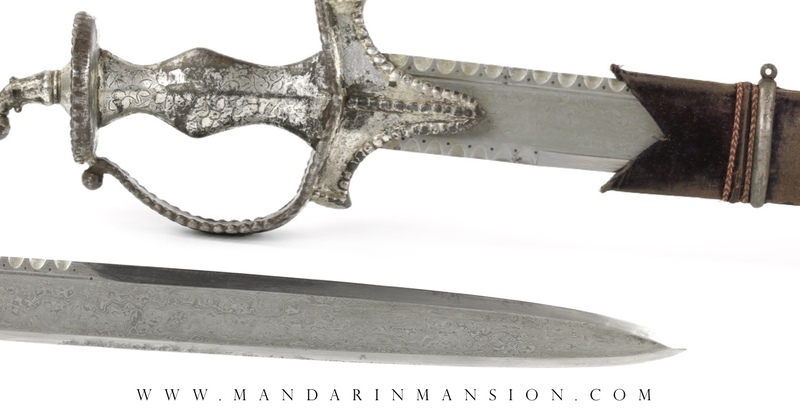 Its appeal is in the sharp geometry and excellent workmanship of the blade, combined with a sturdy iron Hindu basket hilt, clad in silver. 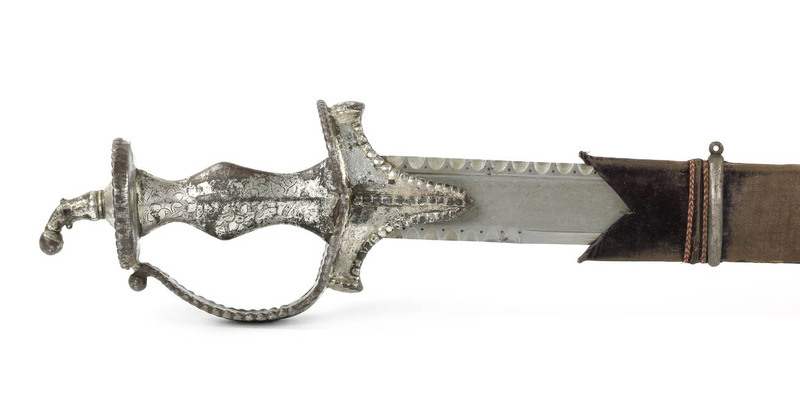 both hilt and blade are full of interesting design features for the discerning collector to enjoy. The above was written to the best of my current knowledge. 1. For these practices, see: Robert Elgood; Hindu arms and Ritual , Eburon Academic Publishers, Delft, 2004. Pages 66-78. 2. See: Philip S. Rawson; The Indian Sword , Arco Publishing Company, Pennsylvania, 1969. 3. Thanks Runjeet Singh of www.runjeetsingh.com, personal communication.